Resource > Blu-ray > How to Burn a Blu-ray? Summary: In this article, we are going to mention two great software tools to burn Blu-ray. So, you are going to learn how to burn a Blu-ray as well. As the technology grows, new ways; in fact, better ways are evolving to entertain yourselves in the much better way. In the older days, people used black & white TVs, and then color CRT TV came, now LCD, and LED are in the market for the optimum experience. Similarly, there other things too which are gone too far. One of those is the way; we used to watch and store videos. You can now burn videos to Blu-ray disc which is capable of storing videos in HD quality and even ultra HD which is 2160p. Blu-ray discs are used to store several hours of video in high definition. If you have a TV with a big screen and want to watch a movie then go for Blu-ray because due to its quality, you can enjoy the movie in HD quality even on bigger screen. In this article, we are going to mentiontwo great software tools to burn Blu-ray. So, you are going to learn how to burn a Blu-ray as well. DVDFab Blu-ray Creator is a superb software program to burn Blu-ray quickly. It burns all types of videos including HD camcorder videos, etc. · Burn almost all types of videos to Blu-ray. · It offers burning multiple videos to one Blu-ray disc. You can set the playback time as well to manage the timing of play of different videos. · The burning speed is quite better than other software tools. · It burn high-quality Blu-ray discs to offer you optimum experience. · You can click the wrench icon to choose the output as BD-25, BD-50, even BD-5, and BD-9. · You can choose the audio track as per your requirement. · You can add external subtitles to the video as well while creating the Blu-ray of it. 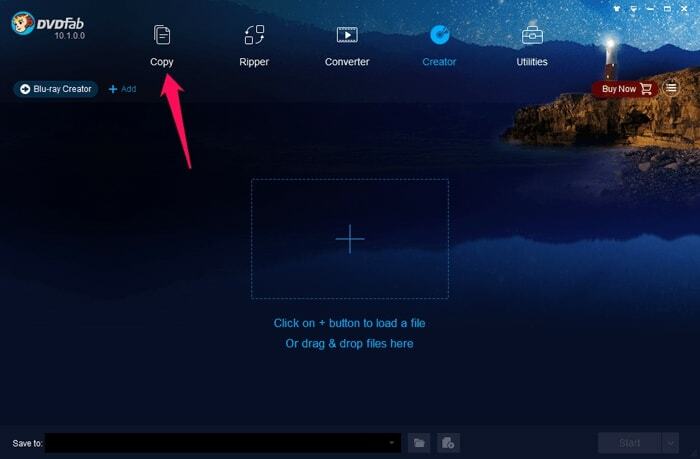 How to Burn a Blu-ray using DVDFab Blu-ray Creator? First of all, download DVDFab Blu-ray Creator, and install on your PC. Now, launch it. You will see the clean user interface with options such as Copy, Ripper, Converter, Creator, and Utilities. You need to click on Creator. Now, click the big + icon to load the video file from your PC or you can simply drag any video file to this interface to load it. Now, you can click on Advanced Setting icon which looks like Wrench. There you can choose the output as BD-5/9/25/50. And there you will find “Custom Menu” which is there for setting the Blu-ray disc’s menu page. In short, it is there to design the welcome screen for the disc. Click Custom Menu. That will open the customizer. You can move and edit the texts, and even add different clip arts as well. You can also set different theme as shown in the right section. Once done, click OK.
Now, select the directory for the output Blu-ray. While selecting the directory you will get various options which youcan choose as per your requirement. If you want the video to burn to a Blu-ray that can be played on a physical Blu-ray player, you must select your optical drive in the drop-down list the directory. If you want to convert the video to a Blu-ray folder, you should click the “folder” icon to select a directory. If you want an ISO file, you should select the “ISO” icon to select a directory for it. Now, click Start, to initiate the process of burning the video to Blu-ray. Now, the software will try to detect the writable Blu-ray disc into the DVD drive. If it finds it, the writing process will start. If not, you have to insert it, and then proceed. 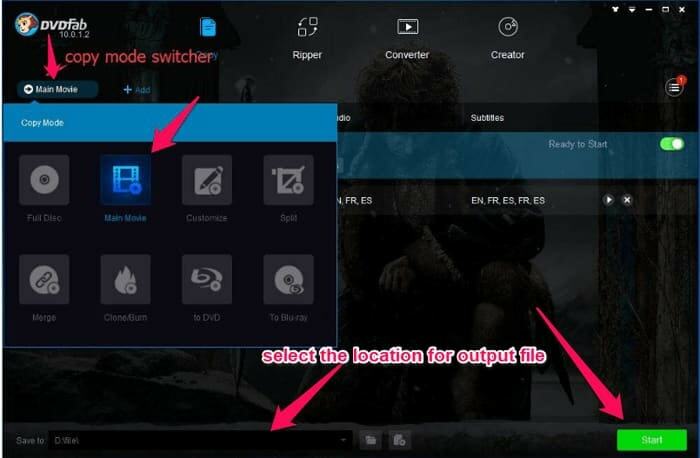 This is how to burn a Blu-ray using DVDFab Blu-ray Creator. Blu-ray copy is slightly different from Blu-ray Creator. The Blu-ray Creator burns any video to a Blu-ray disc, but the Blu-ray Copy copies the Blu-ray discs/ISO files/folders to a blank Blu-ray disc. It is not a Blu-ray authoring software program like Blu-ray Creator, but it copies/clones/burns existing Blu-ray discs to a blank Blu-ray disc. It can be termed as Blu-ray copier or cloner. · It is the first software tool of its kind that clones Blu-ray discs to another. 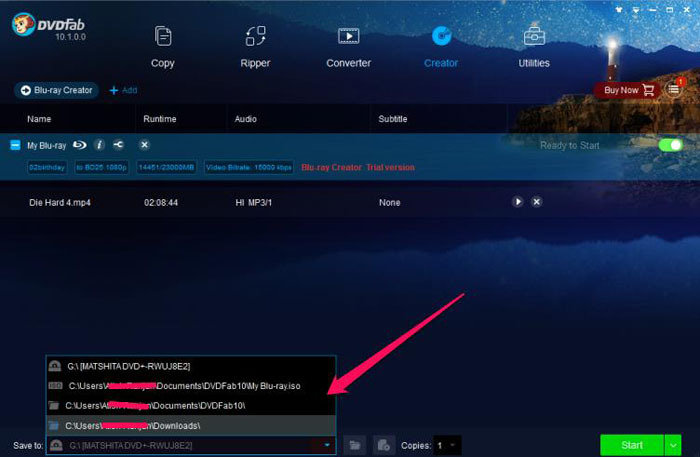 · With the help of DVDFab’s Cinavia removal feature it can remove Cinavia watermark while copying the Blu-ray discs that are Cinavia protected. · It can copy Any Blu-ray to Blu-ray/DVD/AVCHD Disc or your PC’s Hard Drive. How to Copy a Blu-ray to another blank Blu-ray disc? First of all, download DVDFab Blu-ray Copy software, and then install it on your PC. Once the installation process is completed, launch it. Now, select copy mode as Main Movie. Alternatively, you can select any as per your requirement. In the next step, click the + icon and locate the Blu-ray movie or disc. Or even you can just drag the video and drop here. If it is ISO file/folder, just drag it to the UI to load it. Since you choose Main Movie as the mode, you are able to choose the titles, chapters, audio tracks and subtitles you want. After the source is loaded, you can click the Wrench icon to go to advanced setting where you can choose different Blu-ray formats as output such asBD-5, BD-9, BD-25, or BD-50. Now, select your optical drive as output location. You will see the progress window, and in some time the Blu-ray will be copied. Once the process is done, you can go ahead, and check out the copied Blu-ray at the output location, and you will find that it’s done successfully. 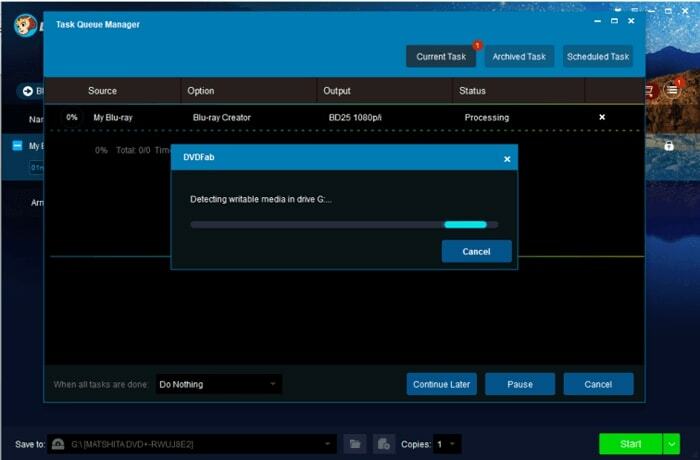 That is how to burn Blu-ray using DVDFab Blu-ray Copy software tool. 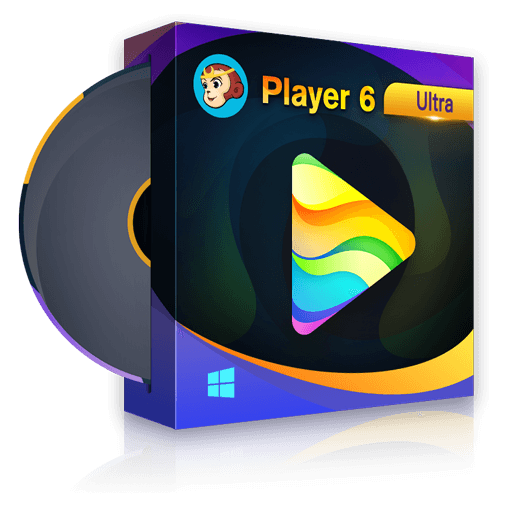 When you are in need to find the answer of how to burn a Blu-ray, both DVDFab Blu-ray creator and DVDFab Blu-ray copy will work, but when it is about a Blu-ray authoring software, DVDFab Blu-ray Creator will work. There are times when we all need to either create a new Blu-ray disc from a video or just copy a Blu-ray to another storage device such as DVD, Blu-ray disc, HDD, etc. Then, you can use any of these software programs as per the need.